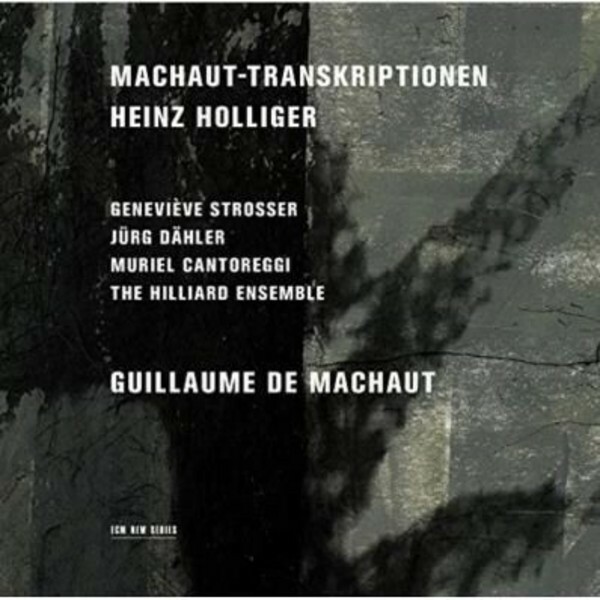 Swiss composer Heinz Holliger’s Machaut-Transkriptionen comprises a spacious cycle of pieces written over a ten year period beginning in 2001. An imaginative re-investigation of the work of the great 14th century French composer-poet Guillaume de Machaut, it is scored for four voices and three violas. Note-for-note transcriptions of Machaut give way to Holliger’s increasingly creative refractions of the music. In Heinz Holliger’s works, the succinct term ‘transcriptions’ conceals multi-layered variants of the enigmatic source material and the most subtle diversification of sound, using the technical possibilities of the 21st century. In the complete, almost one-hour cycle, Machaut’s original compositions, performed a cappella, have been interwoven with Holliger’s variations. Four of the transcriptions have been arranged for three violas alone. The traditional monophonic 'Lay VII, Amours doucement me tente', however, appears in a new four-part vocal setting, and in the concluding Complainte from ‘Remede de Fortune’ the singing voices join the violas. As Holliger notes, his in-depth study of Machaut opened up new vistas for his compositional activity and his admiration for the source material is mirrored in the outstanding performances of the violists and singers. The Machaut-Transkriptionen proves a perfect vehicle for the Hilliard Ensemble’s set skills as interpreters of both old and new music, and this recording, made in 2010 in Zurich, captures the vocal group at the heights of its powers. Their own affinity for Machaut is also documented on their album of his Motets (4724022).